A "tactile transducer" is a loudspeaker that you feel instead of hear. It's basically a speaker driver that attaches to your chair to give you the feeling of extreme low frequency vibrations. This is very useful in the studio when a drummer can't get the level of his kick drum loud enough. The engineer places a device called a Bass Shaker (made by Aura) on the drum throne and suddenly the drummer can feel the kick drum and suddenly it seems a lot louder than it really is. It's a cool device that really does work, since the mind is tricked into thinking everything sounds bigger than it is because you can feel the vibrations. I'm not sure if this is a real product or not, but Dave Mathews Band bassist Stefen Lessard is using an interesting twist on the idea called a Fonz Foot Wedge on the current DMB tour. 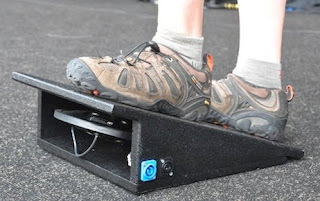 This is the same idea as the bass shaker on the drum seat, but it's connected to a board that you can put your foot on to feel the vibration. In the case of Lessard, he's getting the vibrations from just the kick drum. In this case, it's not so much to fooling the brain into thinking the kick is louder as it is to stay in the groove with the drummer. A trick of many studio bass players is to put their foot up against the kick drum to feel it, which helps to fall into the groove a little easier. The Foot Wedge seems to be just the ticket for this purpose. Staying with out theme of backing tracks for the week, here's something slightly different. It's take #1 of The Beatle's hit Day Tripper (take 3 was the master). If find it fascinating for a number of reasons. 1) It's definitely an early take in that not only is it incomplete, but you can tell that the band was unsure of the bridge, so the playing is somewhat tentative. 2) Listen to the "stereo" track. When stereo was new there was no such thing as a pan pot on a console for a few years. Consequently, the only choices the mixer had for track placement were hard left, hard right, or both tracks simultaneously. What you hear on this track is an early attempt at stereo, with the drums and bass on the right, and the guitars on the left. This makes it pretty easy to pick out the parts though. 3) Listen to how tightly Paul and Ringo play together. It's especially noticeable on the build at the end of the bridge where they're both together not only timing-wise, but phrasing as well. 4) Listen to the sound between John and George's guitars. Both fill different frequency spectrums perfectly, without the need for extensive EQing (they hardly had any EQ in those days). Also listen to the interplay between the guitars, with John playing a steady rhythm to George's mostly single note lines. This was and still is an excellent example of guitar arranging. 5) For an early take, the energy of the track is great! The Beatles could certainly rock when they wanted to. It wouldn't be fair to play only the backing track to Panama without hearing the really energy of the song - Eddie Van Halen's guitar. Here's the isolated track. 1) Eddie has a slight mis-picked note at :28 when he plays the harmonics. Never bothered me before though. 2) Ed is a great rhythm guitar player and he's really exceptional at going back and forth between lead and rhythm without the bottom falling out of the track both in sound and energy. 3) Once again, the guitar sound is signature Van Halen. There's a medium length delay on the guitar which in turn feeds a medium decay reverb. On other songs it's easier to pick up when there's a dry guitar panned left and the effect right, but it's basically the same thing. 4) I'm not sure if the very end of the track is cut off or if it was a slightly late mute for the vocal ending. Anyone know for sure? Staying with our Backing Track theme for the week, here's one from a rock radio standard - Van Halen's "Panama ," off of their album entitled 1984 . In this case we'll be listening to the everything but the guitar, although you can still hear a little of it in there as leakage. Here's a few interesting things to listen for. 1) The drums are compressed really hard to make them as punchy as they are. You don't notice it in the track, but you do during the intro to this video. 2) Michael Anthony is a very underrated bass player. Listen to how solid he is here. He's playing 8th notes through much of the song but he's right on the whole time. Remember this was in the days before cut and paste and Beat Detective so it's real playing. 3) Likewise, Alex Van Halen is very disciplined in the his drumming. The fact that he stays with a pattern during most of the song keeps the section solid. 4) David Lee Roth's vocal sound is signature Van Halen - delayed verb with a long decay along with a long delay for depth. 5) The background vocals, which you don't hear much of in the final track, are interesting in that they have a very short reverb which makes it pretty indistinct. It does it's job well though, by bolstering and changing the sound of the pre-chorus and chorus. 6) This song is an excellent example of dynamics on a record. Listen to how the band lowers its intensity at 2:20 while keeping the tempo and feel the same. 1) Drummer Chris Layton and bassist Tommy Shannon are an excellent rhythm section. These guys are first class all way in terms of being able to lay down a shuffle rhythm. 2) Like most great blues drummers, Chris plays on the back end of the beat. Listen how far back the snare is. Also notice how he pushes to the front slightly during the solo to raise the song's energy, as any great drummer does. 3) The recording is very modern, with the drums present and in your face and obviously multi-miked. 4) Notice the click at the beginning of the song. This may have only been played at the intro as a tempo reference for the drummer, or it could've been an active click during the entire song. Anyone know for sure? 5) Listen for the guitar overdub during the solo. It's very simple, but perfect for the song and never makes it feel like it was overproduced.